Hot air balloon rides - The ultimate way to get to tour Lancaster County! And there is no more exhilarating way to experience hot air ballooning than launching with 15 other balloons! This unique and exciting experience cannot be replicated anywhere else. 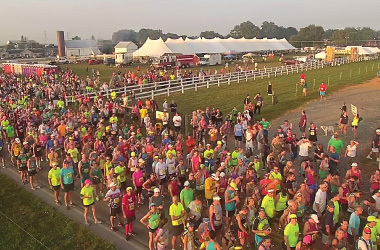 Run, Ride and Soar is the largest hot air balloon festival in Lancaster County and offers beautiful views of the countryside and of the races and their paths on the ground below. So whether you’re in town to see peaceful Lancaster farmland or to participate in the races, be sure to book a hot air balloon trip for your friends and family for this once in a lifetime experience! Space is limited! Visit their website at www.ushotairballoon.com or call 800-763-5987.